The PKK-affiliated People's Protection Units (YPG) terrorists targeted a Turkish military convoy heading north in the Syrian city of Idlib with a car bomb on Tuesday, killing a civilian personnel and wounding a soldier and another civilian personnel, the military said in a statement. 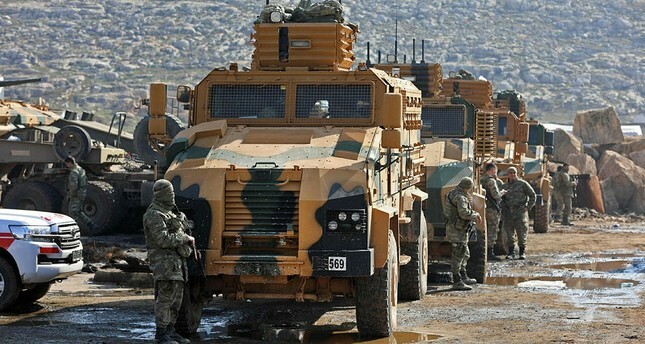 The military said terrorists detonated a vehicle while a Turkish military convoy deployed in Idlib as part of an international agreement to establish de-escalation zones was passing through. It also offered its condolences to the killed civilian's family and wished a speedy recovery to the wounded. On his Twitter account, Turkish Forestry and Water Minister Veysel Eroğlu said the martyred civilian worked at the ministry. "Today, a member of the General Directorate of State Hydraulic Works, Yasin Tanboğa, who joined Operation Olive Branch, was martyred. Mahmut Pakyürek was seriously injured and specialized sergeant Omer Gunes was injured slightly. We wish God's mercy for the martyred staff and a speedy recovery for the injured. We wish condolences to his family and to our nation." The deployment in the northwestern region was launched last October under a deal reached with Russia and Iran during the Syrian peace talks in the Kazakh capital Astana. The establishment of de-escalation zones was agreed to in May between Turkey, which backs groups opposed to Syria's Bashar Assad regime, and Russia and Iran, who support the regime. The attack comes after Turkish military units and Free Syrian Army forces cleared 24 areas of YPG/PKK and Daesh terrorists from Afrin in northwestern Syria on day 11 of Operation Olive Branch, which was launched on Jan. 20. According to the Turkish General Staff, Operation Olive Branch aims to establish security and stability along Turkish borders and the region as well as protect Syrians from terrorist oppression and cruelty. The operation is being carried out under the framework of Turkey's rights based on international law, UN Security Council resolutions, its self-defense rights under the U.N. Charter, and respect for Syria's territorial integrity.